Here's one of the superb new online slots game from NetEnt that which you can play. Beware the eerie bloodsuckers! 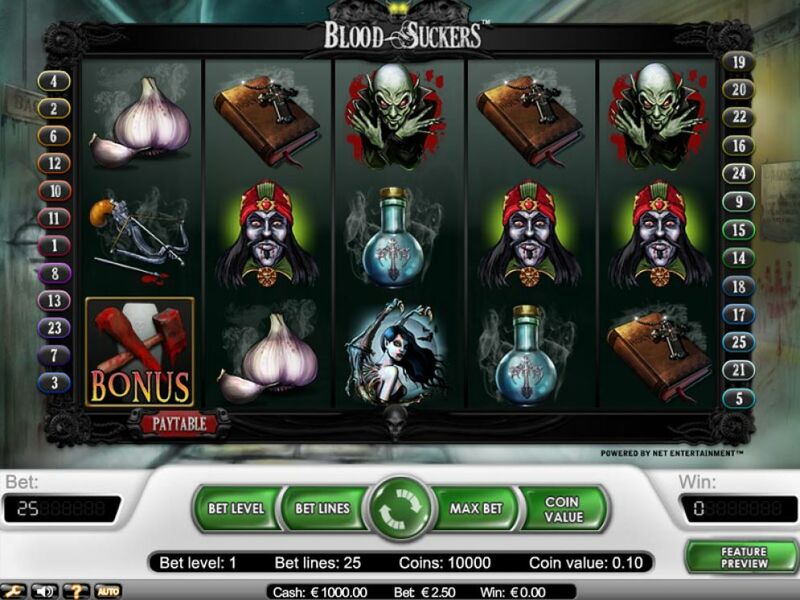 Vampires abound in this creepy online slot from NetEnt. If you’re brave enough to take it on you could be handsomely rewarded with supernatural prizes, fall foul of the suckers and your prize pot will die… This online slot will immerse you in Victorian vampire culture: spooky and gruesome, but with big chances to get your claws into some awesome prizes. If you’re a fan of Twilight, True Blood and the Vampire Diaries sink your teeth into this bloody little number. Check out our entire list of play casino game now. NetEnt has rapidly become one of the most popular makers of high spec online slots. Formerly known as Net Entertainment, NetEnt are renowned for making online games that are as engaging and entertaining as they are rewarding. This Swedish company founded in 1996 were the first to develop online titles using Java and now it uses HTML5 it continues to be the forerunner for casino software. NetEnt also has a progressive jackpot network that has rewarded players with tens of millions since it started. If you love promo's, get the best slot machine bonuses right now! It’s a stylish affair with really nice graphics, detailed illustrations and a well thought out theme but ultimately it’s a 5 reel, 25 playline slots. The developers have really made the effort and every symbol is vampire-themed, you’ll see garlic, potions, a bible and silver cross, and some vampire hunting weaponry. Whether you like it or not there will be vampires to contend with as well, a female vampire with wings, and 3 male vampires, 2 really creepy ones and one more dapper – think Tom Cruise in Interview with a Vampire. Play nicely with these standard symbols and you’ll get some useful payouts. Wild – If you see a hungry, bloodthirsty vampire biting a poor victim’s neck that’s the game’s wild. It will substitute for all symbols bar the scatter and bonus to trigger winning combinations. Scatter – If you land yourself 3 or more scatters anywhere across the reels in this game you’ll receive ten bonus spins and the best bit is all the winnings are tripled when you’re in the free spins mode. Bonus – A bloody hammer and stake are the bonus symbol in Bloodsuckers. If you can line 3 or more of these up on active payline you’ll trigger the bonus game. Trigger this and you’ll be transported to a burial chamber full of coffins. Be brave, you need to open these coffins to reveal your prize! If you open one with a vampire in it will get stabbed in the heart in pretty gruesome fashion… if you click on an empty coffin the game will end and your bonus score will appear. 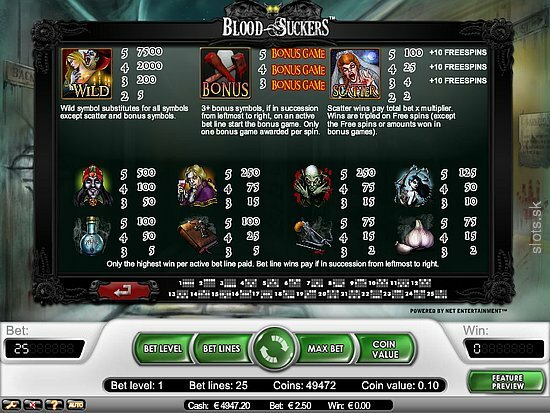 Bloodsuckers is a tremendous slot game that mixes blood and gore with a ghostly Victorian feel. Traverse through 5 reels of bloodthirsty vampire gameplay and explore the huge amount of free spins and cash reward that will be on offer to you. Beware of the demon barber of Fleet Street.